64 kids, 3 rangers, 50 things???? 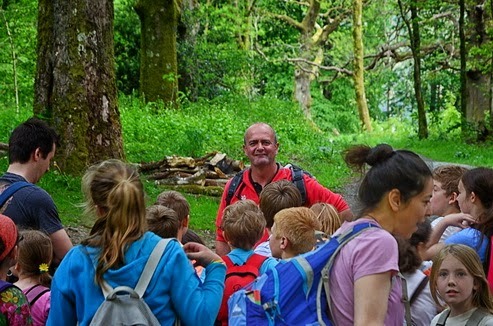 School visits to our woods are becoming a fairly usual occurrence these days, and so when our friends at Lorton Primary rang to say they’d like to come out for a 50 things day at Holme Wood in Loweswater, of course we said yes, and then we looked at the numbers! This wasn’t going to be easy but was certainly doable with a bit of slick timing and a fairly flexible pan, a quick plan was cobbled together and Rangers Dan ,Paul and Mark talked it through got the kit together and hoped for fair weather amongst the thunder storms of previous days. 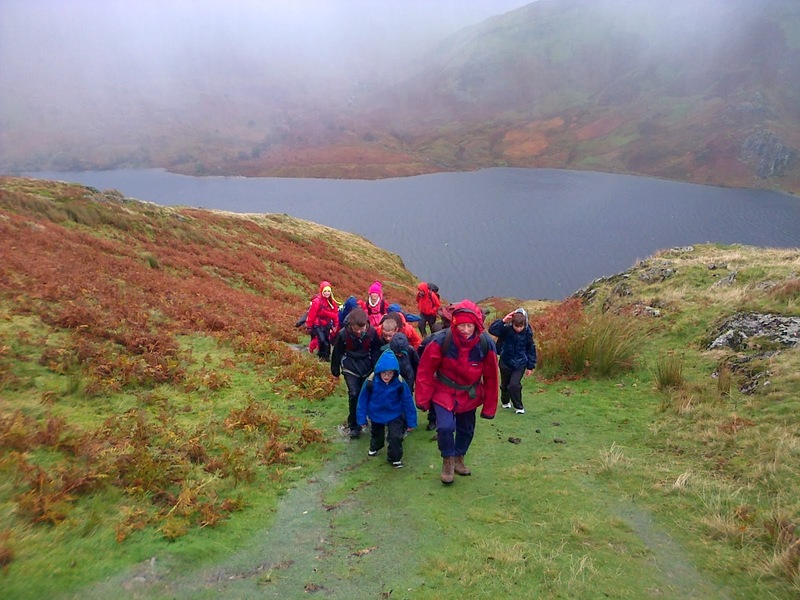 The morning arrived and before even getting to the wood the children, and staff with parent helpers, had already completed one of the tasks, to take a long walk! Our narrow lanes weren’t suitable for the school buses so the day started with a 1.3 km hike along the farm track, where the mobs of lambs took minds of the long walk, and made it a tad slower as well! 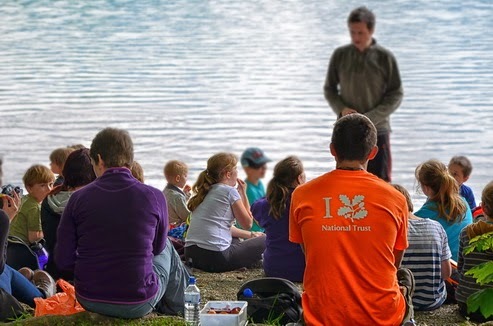 Once on site we split into groups with Ranger Dan taking charge of the younger kids who set off pond dipping, we didn’t actually have a pond, the lake had to suffice. They would follow us, using a treasure map and making a stick trail on the way. Rangers Mark and Paul led the rest of the group in to Holme wood, where after a swift talk about the day and a bit of health and safety we split again, Paul taking 2 groups off den building whilst Mark’s group set about lighting fires without matches, and then cooking marshmallows and trying out the rope swings over the lake. We’d had to time each session to about 30 minutes, necessary in order for everyone to have a go at most tasks but we needn’t have worried, the quality of den building was impressive with some very sturdy examples and some good innovative designs being created well within time, really good to see how the builders organised themselves and got a system going, and all with the smell of roasting marshmallows drifting through the woods. A couple of whistles from Mark and the groups changed over, and now the infants and Ranger Dan had caught us up and were busy bug hunting, turning over piles of bark and leaves and finding all sorts of weird and wonderful mini beasts , using magnifying glasses and work sheets to identify their captures. Lunch time! 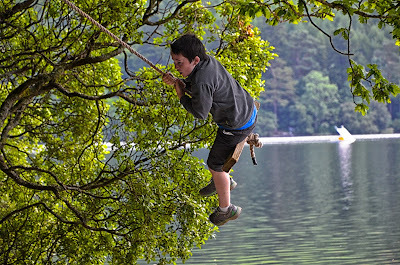 So far we’re on schedule for the day, Things are being done, den building, rope swings, map reading, going on a long walk, cooking on a campfire, after lunch we have mud pies, climbing trees out over the lake, slack lining, dam building, pooh sticks and grass trumpets, we need a snack for sure. The afternoon sessions flew by with everyone having had a go at everything, the long walk back to the buses was accompanied by varying degrees of grass trumpet playing and laughter, it was as once again brilliant to hear our woodlands filed with giggles, both from the kids and the staff and parent helpers, who it must be said were excellent we really couldn’t have managed the day without their help, Thank you. We had lots of kids asking if they could come back? Of course you can, just let us have a wee rest first! 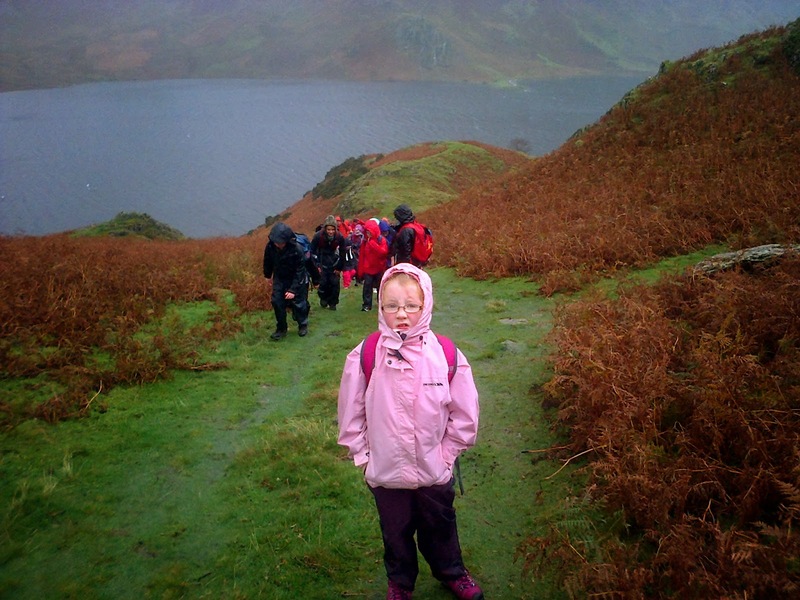 Buttermere is one of the few places left in the North Lakes with some grassy untouched paths. pre-emptive work can help keep the paths natural. "Pidgeon holes" a line of circular bare patches can occur on grassy slopes when a large numbers of walkers follow the same line up a hill. Although these foot holes make the hill easier to climb, they quickly join together into a groove that water runs down creating a gully. The holes can be easily repaired using seed, turf and cloche netting (a willow frame covered with chicken wire) that is used to protect the area while it regenerates. The willow is locally sourced from a basket weaver, Phil Bradley. 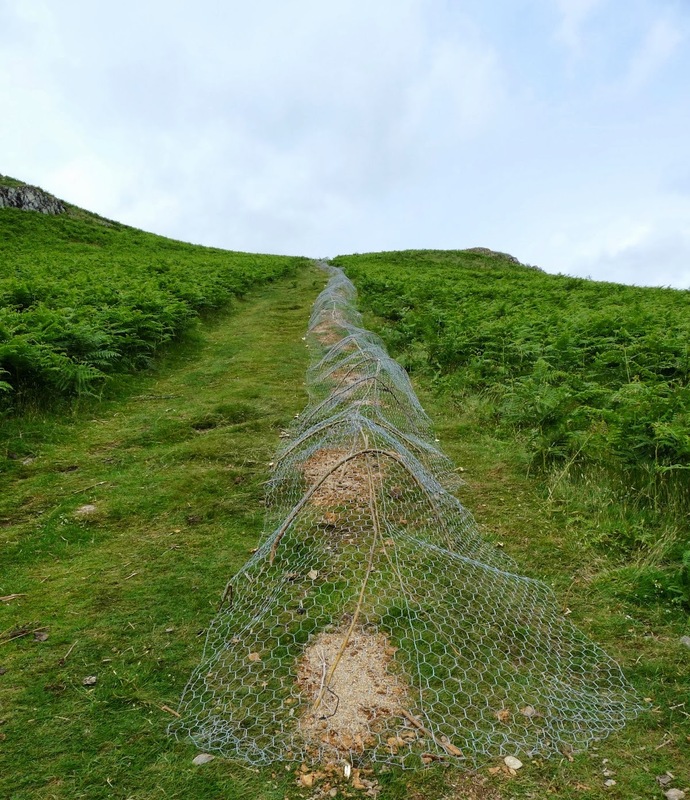 All the work was done by Fix The Fells volunteers supervised by a National Trust ranger. When we removed the netting the local herdwick sheep had a field day. Most of our blog posts deal with the day to day tasks involved in keeping our countryside in tip top condition, occasionally we have some fun and occasionally we even touch some hearts! Thanks kids, let's do it again real soon! On a very wet and wild Wednesday, Ranger Dan and myself, along with our guest blogger, intern Becky Ingham took 29 children aged 7-11 up Rannerdale Knotts to look at a range of subjects from glaciated valleys, NT footpath management, the water cycle and farming. The weather was magnificent, in the almost blown off your feet and wet enough to make a duck think twice about going out kind of way. 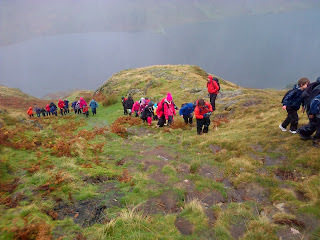 It definitely proved the saying that ‘there is no bad weather, just bad clothes’ as we were mostly kept dry and warm by our waterproofs. 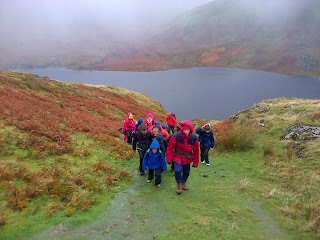 We had truly fantastic views as the clouds moved, showing us the fells and then hiding them again. At one point we could see the rain shadow hurtling towards us over Crummock Water and making the fells behind almost disappear. 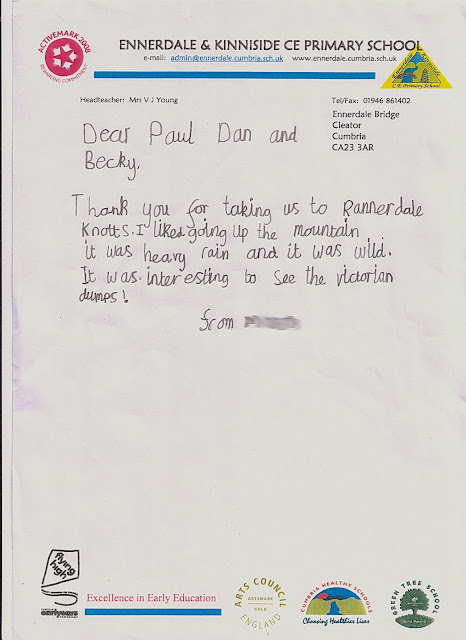 The Ennerdale kids were fantastic, as Paul said; ‘mini mountains should have mini mountaineers’ and that’s definitely what we had. I don’t think I heard a single moan about the weather, even from the littlest. We'd like to thank the children, teachers and parents, and of course Becky for giving Ranger Dan and I, a cracking if wet day out, looking forward to next time. September, my wife and I were out visiting family in Canada. They are based in Toronto, and so we were able to explore some of the countryside in the region of the Great Lakes. Driving north on Highway 11, you "soon" (in Canadian terms - it is a very, very big country!) enter the fabled land of Muskoka. This is located on the southern edge of the Canadian Shield country. The terrain is very contorted , undulating rather than hilly, glacially scoured outcrops of granite and gneiss largely covered by mixed woodland, harsh, demanding, but softened by a myriad of sparkling lakes. It was the inspiration for the famed "Group of Seven" artists, and many Canadians regard it as the start of the "true" Canada, the edge of the wilderness that stretches up to Hudson Bay and the Arctic Circle. We stayed in a lovely B&B right on the shore of Fairy Lake. Here's a picture of their "dock". It was a truly beautiful location, made even more special by the first hints of the onset of the fall; a chilly nip in the morning air, and the subtlest change in the tint of the woodland foliage. One morning, the cold night air had fallen on the warm water of the lake, producing a shimmer of mist, a picture of transcendental loveliness. I felt very privileged as I stood on the dock trying to capture the image, but when I looked at the photo I was dismayed to see the number of other docks, each with their accompanying boathouse. And when I looked at the wider scene, I realised that almost all of the shore of that beautiful lake was in private ownership, and accessible to none but a privileged few. This much loved area has little protection beyond local authority restrictions, and it struck me as being an area that was ripe for some sort of safeguarding, maybe not National Park status, but perhaps a Provincial Park, and yet it has none. From time to time what seems to be a simple task, becomes a bit of a challenge for Ranger Dan and myself, not such a bad thing though as it allows us to be slightly imaginative and change how we do things, also makes life more interesting I reckon! 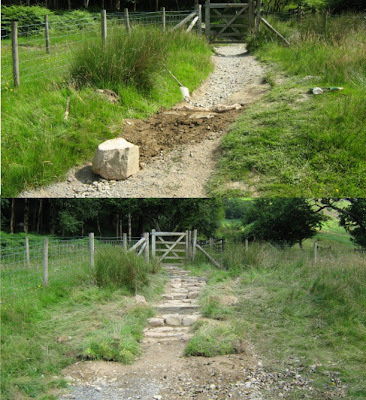 A piece of footpath maintenance at Dunthwaite was a case in point, easy enough job but access to the site is a major problem, so what do we do? well we just use what's already there! A little bit further on, a section of post and rail fencing which prevents our visitors plummeting down a slope to the river Derwent had over the years slowly started to lean over towards the river, on inspection the timber seemed sound so rather than rip it out and replace it we ripped it out and re sited it, standing upright and braced against the slope it should last a good while longer, and to be honest looks much better than a shiny new bit of fence in amongst the old, cheaper too which should please our accountants! 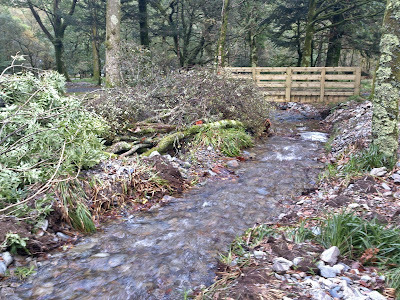 Another opportunity to carry out a repair using only what was on site presented itself at Holme Wood in Loweswater where following a very localised storm a stream had burst it's bank deposited a huge amount of debris in the wood and washed out a considerable section of all access path. On another day we'd simply have got a digger in and rebuilt the bank but not this time, co-incidentally as we were in a wood there were a few trees around, and some of them right where we needed them, Ranger Dan and myself set about felling the trees so they lay across the breached banks forming a structure that we hope will catch silt and debris from future flood events and become a natural dam, and if it doesn't? well we're no worse off, the trees will coppice back up we haven't spent a fortune, happy accountants again!! 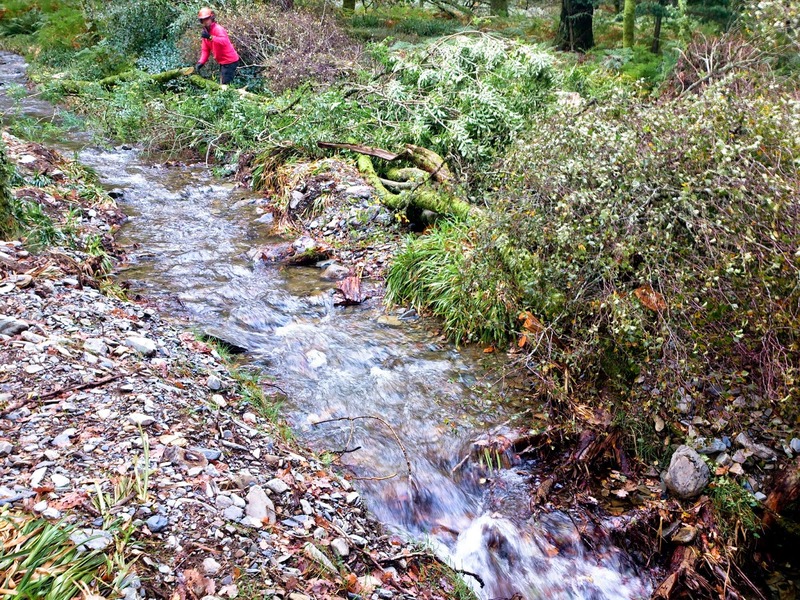 Filling the gaps in stream banks, beaver style! and there we arrive at the title of the blog, North Lakes Rangers beavering away, simples !! They do say ‘variety is the spice of life ‘ and of late we’ve had our fair share, aside from the seasonal chores which come with the preparation for our summer visitors we’ve had a few diversions, an opportunity to have some work experience students from nearby Cockermouth school gave us a chance to show 3 young people Ella, Cain and Matthew, some of the tasks which go into maintaining a countryside property and it has to be said they threw themselves into it with enthusiasm, one has since asked to come back as a summer holiday volunteer, which of course we have accepted. Some of our visitors are more of a challenge than others, most folks are content to visit, enjoy our landscape, perhaps take in some spiritual enlightenment and leave refreshed, a minority of others however seem intent on trashing the place entirely, this past week we’ve been spending most mornings removing rubbish from lakeside fields, broken bottles, cans, barbeques, deckchairs, lots of underpants and general debris! 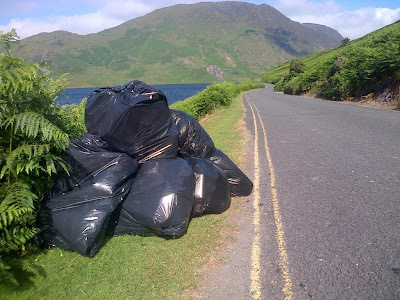 While this can be quite disheartening, and we do have a’ real’ job to do, there is some hope, one evening we went round the known trouble spots and gave out litter bags, the reception we got was excellent and on the following morning we had perhaps an 80% reduction in the amount of time it took to clear the sites, so to those who took their rubbish home, Thanks!! 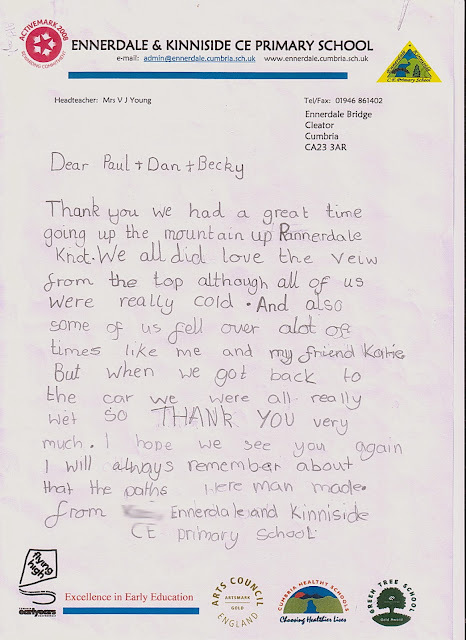 We’re sometimes told we must have the best job ever and some days that’s very true, the end of primary school for some local kids gave us the chance to let them have some fun in our woods, year 6 pupils from both Paddle and Ennerdale schools visited Holme Wood at Loweswater and took part in some of our’50 things to do’ activities including rope swings, den building tree climbing and most popular by far, mud slides!! 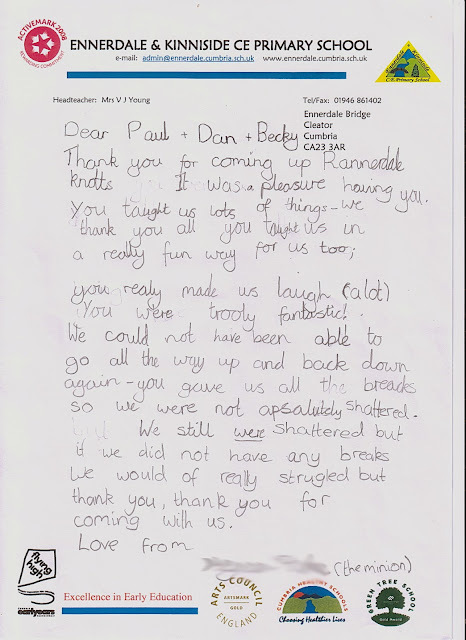 Fantastic to once more hear our woodlands filled with laughter although I dread to think what the laundry bills were like afterwards, many of the children were keen to bring their parents and families back to have some more fun, let’s hope we’re around at the time, after all we need playtime too! Then it was back to the real job, still fun though, a section of path leading from Pike Rigg to the lakeshore at Buttermere had become seriously eroded due to water damage and increasing traffic from walkers, the most suitable solution was to use stone pitching, a method more usually used in the uplands by the ‘experts’ at Fix the Fells, we think we matched their prowess however? One difficulty we had was getting stone to the site, however the recent dry weather gave us a solution, much to the surprise of visitors and particularly photographers, each day Ranger Dan and myself would drive along the lakeshore and at times through the lake itself to access the site. The new path took shape quickly and has been well received by all who have used it, already it’s looking like it’s been there forever. Summer is now in full swing and the North Lakes teams are busy with their summer maintenance. They are also busy with events and one of their main events is on the horizon. 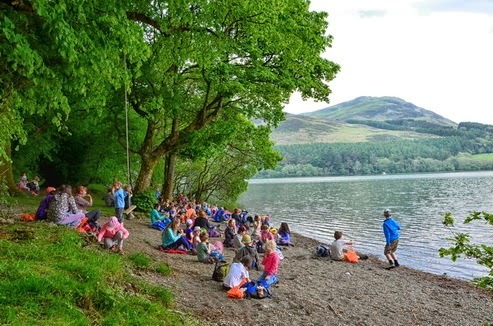 The Derwent Water Regatta is held on the first weekend of August, the 3rd and 4th. It is a modern day attempt to resurrect the long held tradition of summer regattas on the lake. The weekend is action packed with all sorts of fun on the water. From Bath tub racing and Canoe slalom’s to Viking long boat tasters. There is also a BBQ on both days and Saturday evening there will be a bonfire. The event is for the whole family to enjoy. All the action is centred on Crow Park, the Derwent Water Foreshore and Friars Crag, and we can guarantee that it will go off with a bang! The link below will take you to our Facebook page on the Regatta. This will help you to book for any activity. With this project there were different types of jobs. 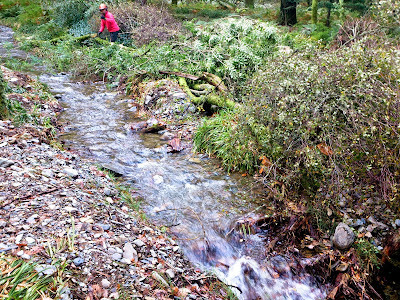 They included path erosion repairs, cutting back vegetation from the paths, and strimming back bracken. A good spell of weather meant it was time to crack on. 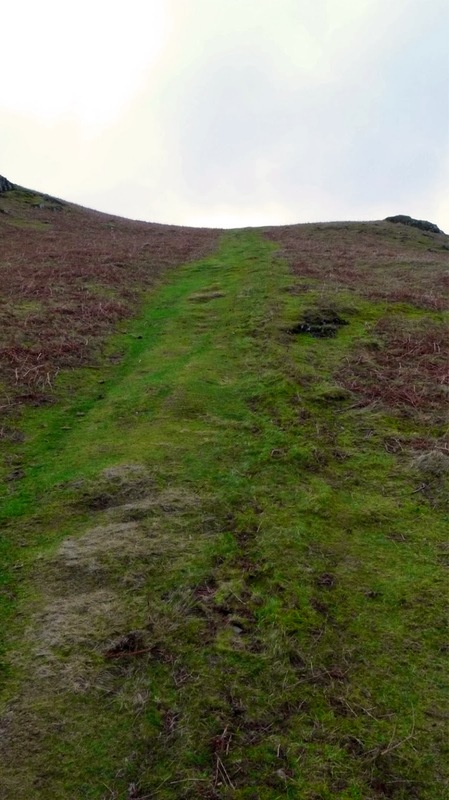 The first job was to strim the bracken back on both paths up at Kinn End. So myself and Paul the Ranger Supervisor from Loweswater took on the first part of the task. Instead of carrying the strimmers all the way to the top we got permission from the Forestry Commission to go on there land and gain access nearer to the site. With both paths strimmed the barriers at the top and bottom of Kinn End could be changed. Blocking off one path gives it time to recover, whilst the other takes the brunt of this popular route. By alternating the usage of the two paths we can manage the erosion. With the barrier not being changed for some time the locks had siezed up. So with some WD40 on the one lock and bolt croppers on the other that solved that problem. The second part of the project was to repair a step-over stile. Again we were able to gain access to the site by going through Forestry Commission land. 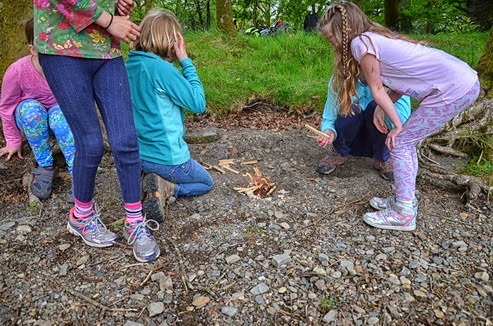 This saved us from carrying all the materials and tools up the fell, and we would like to thank the rangers at Whinlatter for their help in this. 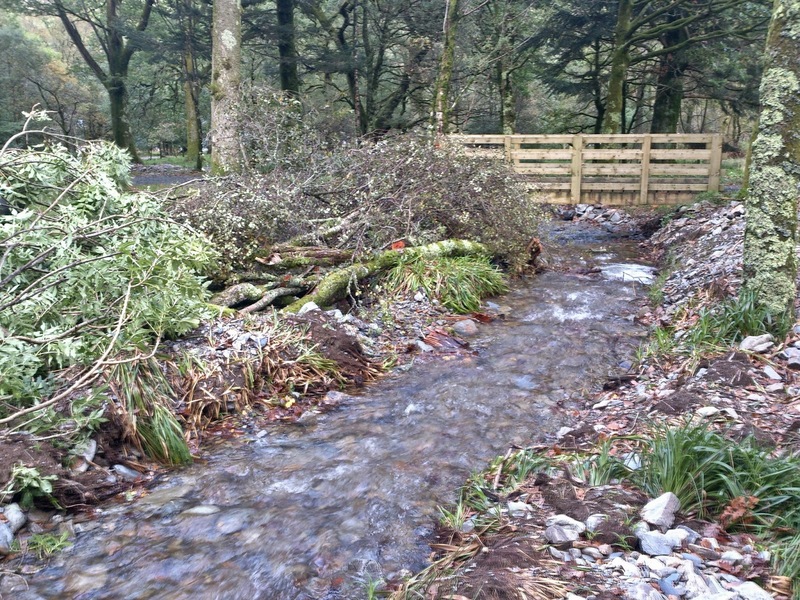 The other part of the project was to cut back the vegetation leading up to Kinn End. This helps open the path up, making it easier for the public to walk, which in turn stops them from making the path wider. We also strimmed the grass, and brambles back that were encroaching on the path. We found that one section of path had started to slip. A simple post and rail revetment backfilled with rocks and soil proved a good “stitch in time” solution. It is always good to catch these problems early, and this will help the path from eroding and washing away. The pictures below help show a before and after of the path. Joe the foot path supervisor and I took on this part of the project. This grouping of several small jobs into a greater task, is a method that we regularly use. This year they have helped on Causey Pike, Scar Crags, Sail, Crag Hill, Grasmoor and Force Crag to Coledale Hause. 18 km, 63 drains cleared to ensure water does not damage the paths - oh and 100 kgs of "upland grass seed mix" spread on the Sail path. Not bad for a days work! 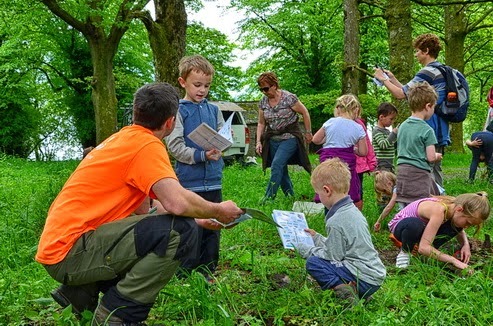 1 National Trust Ranger, 8 Fix the Fells volunteer Lengthsmen and 13 staff. Good day out on the fells with some great people. I work for the North Lakes property managing the Countryside Rangers and the workplan. 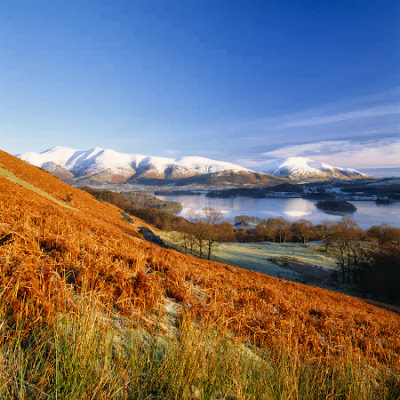 We cover a large area of countryside from Ennerdale across to the shores of Derwentwater.